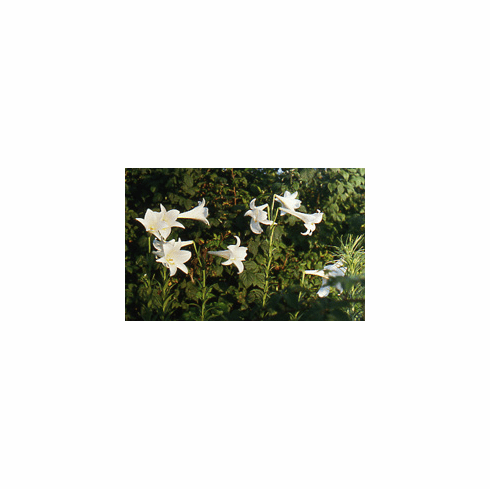 The most recognized of all lilies, its selected variants are grown by the millions each year. Better known as the 'Easter Lily', Lilium longiflorum originally called home the southern Islands of Japan. Fields of Lilium longiflorum can be found growing in field production within a narrow belt stretching from Brookings, Oregon to Smith River, California overlooking the Pacific Ocean. In nature, this species grows about 3 feet tall. Normally flowering in July and August in the garden, the easiest way to obtain bulbs is potted lilies forced for Easter bloom, which can be planted into any well drained garden loam after the bloom is finished. Locate in full sun to light dappled afternoon shade for continued enjoyment for years to come. Once in the garden though, they will revert to their normal blooming time which is not during Easter. Lilium longiflorum is in the breeding background of the scented Asiatic hybrids, also know as LA or Longiflorum-Asiatics.